Insert your text content here, for a better SEO result you can use heading tags for important contents. Enable actions. Action runs by clicking user on the layer. The beautiful Journey Through Time Scenic Byw stretches 286 miles through five counties of Oregon. Beginning in the community of Biggs along the Columbia Gorge, and ending in Baker City, this Scenic route winds through ghost towns and small farming communities and rugged landscapes with canyons and looming rock formations that bring the Old West to life. The wild and scenic John Day River – North America’s second undammed river – runs along much of its route and adds greatly to the beauty of this special Byway. Uncommonly rich in history, the Journey through Time tells tales of pioneers, towns boomed and busted, and prehistoric creatures that wandered this terrain millions of years ago. Geology buffs – and anyone who’s curious about fossils – will take great pleasure in the interpretive trails at the 3 different units of the John Day Fossil Beds National Monument spread out in different locations in Wheeler and Grant County and all reachable on the Journey through Time Scenic Byway. Outdoor enthusiasts of all kinds will find that the route is a gateway to some of the most pristine natural places offering a taste of wilderness and many outdoor recreation opportunities. 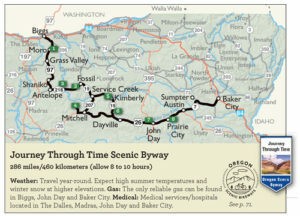 Learn more about the Journey through Time Scenic Byway here! While you’re here, make sure you drive the loop! 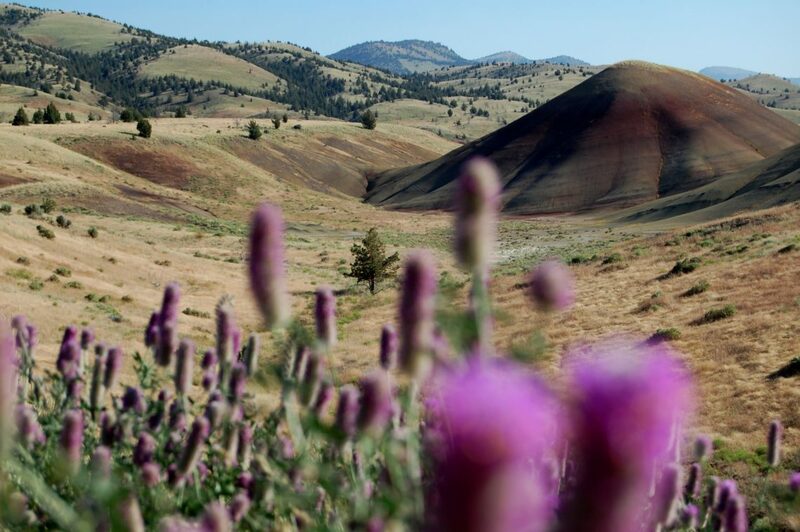 An extra 65 miles of road, all of it located in Wheeler County, has been recently added to the Journey through Time Scenic Byway forming a loop that incorporate the unique Painted Hills unit of the John Day Fossil Beds National Monument, Pillar Rock, Picture Gorge, and other points of interest. 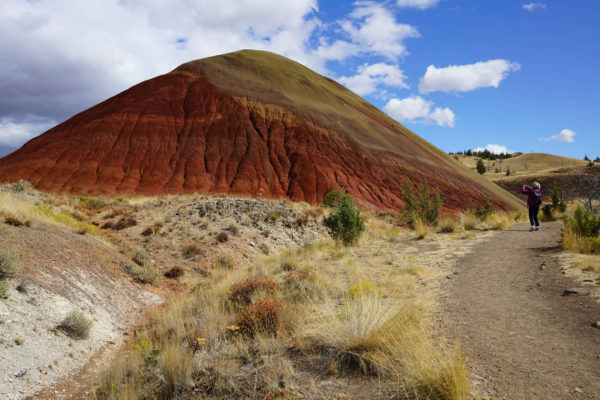 The new route follows Hwy 26 from the Painted Hills through Mitchell, and on past different scenic landscapes to join the original Journey through Time on Oregon Route 19 in the Picture Gorge. The other new section of the byway creating the loop, goes from Mitchell on Route 207 on a winding picturesque road with fantastic views around every bend. In Service Creek it reconnects again with the original Journey through Time on Oregon Route 19. The loop connects the towns of Mitchell, Fossil and Spray offering many great spots along its stretch for fishing, camping, boating, fossil hunting, wild life observation, and plenty of great hiking trails. It also connects all 3 units of the John Day Fossil Beds National Monument – the Painted Hills, Clarno, and Sheep Rock. The John Day Fossil National Monument has 3 units, all easily reached by driving the “Journey through Time” Scenic Byway that winds through spectacular landscapes. 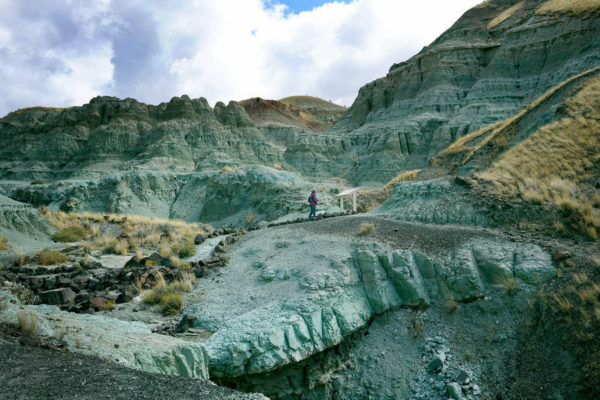 In this ancient geological wonderland you can view all sorts of colorful rock formations preserving a world-class record of animal and plant evolution as well as climate change and a 40 million year history of past ecosystems. 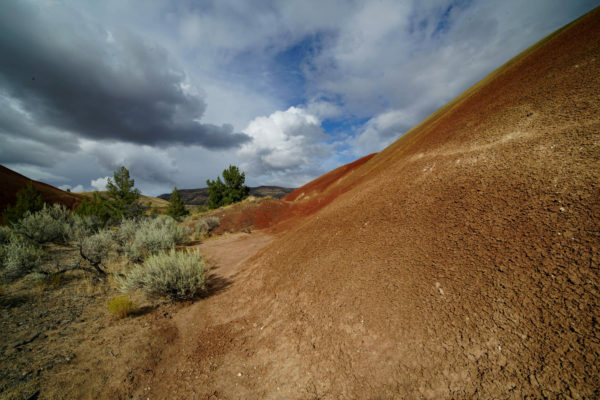 The three units – Sheep Rock, Painted Hills, and Clarno – are at different locations scattered throughout Eastern Oregon and have completely different characters and landscapes. Each of these places offers well maintained walking paths and some easy hikes. 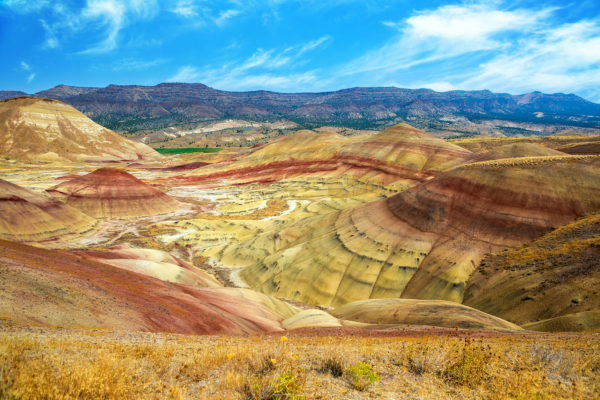 The Painted Hills, one of the three units of the John Day Fossil Beds National Monument, are the crown jewels of this region with their spectacular colors and sublime patterns that seem to have been hand-painted by the master stroke of Mother Nature’s brush. Like on a painters palette, the colors shift and change with the difference of light, weather and the seasons. Every rainstorm intensifies the bands of red and orange, the generous splashes of yellow and gold, and the random streaks of black and grey leaving you speechless and awe struck. Between April and May, rivers of small yellow flowers run down within the cracks of the reddish hills forming golden pools to their feet – a magic sight that draws hundreds of landscape photographers and artists to the place. But no matter what the time of year, the shapes and colors of the Painted Hills are an incredible sight. different volcanic eruptions and changing climate patterns. Once this area was a river flood plain with a warm tropical climate and an abundance of plants forming lush forests with exotic animals such as prehistoric horses, elephants, camels and saber tooth tigers roaming freely. Over time the landscape transformed again and again responding to the powerful forces of nature. Layers of ash and different types of soil mixed with minerals and plant material and eroded causing the unique coloring of the Painted Hills landscape we see today.  The Painted Hills unit is open all year around and has well established hiking trails that either bring you closer within the hills for a better examination or above them for a sweeping panoramic view. 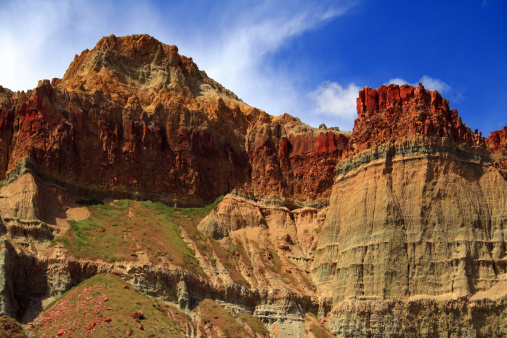 A short drive beyond the main sight brings you to the spectacular Red Hill and the Painted Cove Trail, a short educational hike around a small multi colored clay mound allowing a close up encounter. But there are many more special places within the unit that are waiting to be discovered and explored. You can easily spend a day here or come again and again without ever feeling that you’ve seen it all. There are well maintained picnic areas parking places and great information signs explaining the various geological and natural processes that occurred here through different eras. One thing is for sure – a visit to the Painted Hills will be a one of a kind experience never to be forgotten! 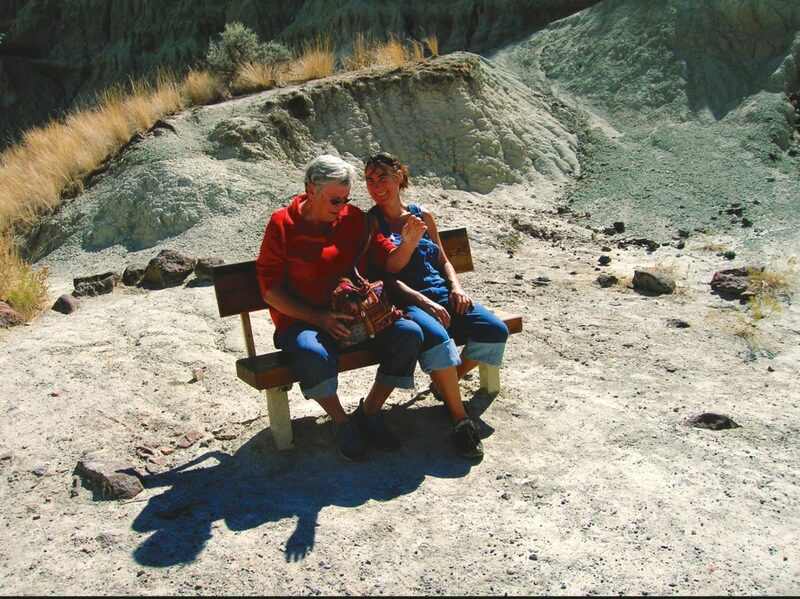 At Sheep Rock, which also houses the info center for all of the units of the John Day Fossil National Monument, the Thomas Condon Museum of Paleontology invites you for a glimpse of the prehistoric history of the region. Children and parents alike love its fantastic fossil collection, murals of plants and animals thriving here millions of years ago, and other wonders. The Blue Basin is only a few miles down the road and offers spectacular walks into a place that seems of a different planet. The John Day River is one of the longest un-dammed rivers of North America. It flows wild and free through canyons, gorges, and picture-book wilderness, passing incredible rock formations and rugged landscapes, pastures, and sandy river beaches. The John Day River curves its way through the wild and untamed land, is magical in all the seasons, and is inviting you to explore, discover, hike, swim, raft, and fish. There are many areas off the beaten track where you can experience the river in all its glory, no matter what the season. There are many places along the John Day River beds that are brimming with wildlife, rare birds and plants. There is always something to see and discover! In winter the river is often frozen and has a different kind of beauty. In spring it is swollen with melting water from the mountains and rushes through the valleys with a powerful force. Summer its rafting time and taking a cooling plunge from the rocks into a swimming hole. We would love to show you our favorite river spots! Smith Rock State Park – another one of the 7 Wonders of Oregon – is about 1.5 hours away from Mitchell and located near the community of Terrebonne, close to Prineville. Smith Rock – like the Painted Hills though very different in character – is another ancient geological wonderland with its towering dramatic cliffs of tuff and basalt, ideal for rock climbing of all levels of difficulty and popular for sport climbing, traditional climbing, multi-pitch climbing, and bouldering. Smith Rock State Park also features many miles of developed trails for many wonderful hiking experiences including some paths that lead along the Crooked River and up into the steep rock formations looming high above the visitors. The trails feature many beautiful viewpoints overlooking the river and the dramatic rocks, and there is a park’s day-use area with picnic spots as well as a visitor center. There is abundant wildlife all around and Mule Deer as well as many mammals are often sighted. River otter and beaver are found along the park’s Crooked River frontage and many birds are nesting along the shore.